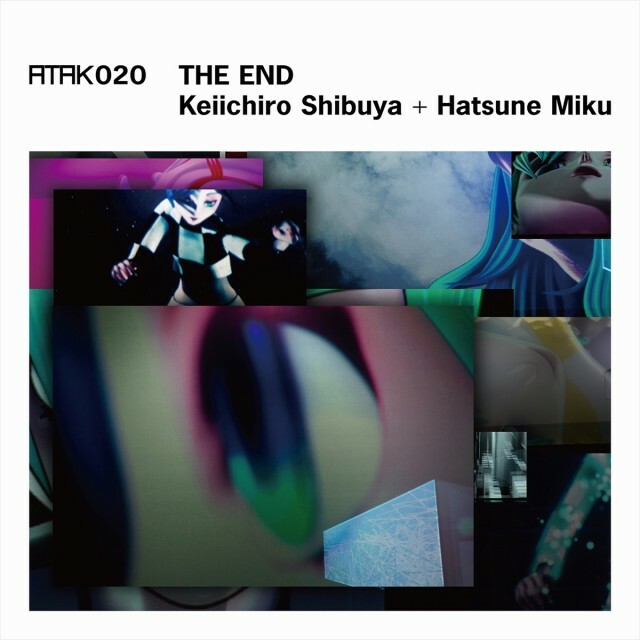 Original soundtrack release from vocaloid opera “The End” created by Keiichiro Shibuya, directed by Toshiki Okada and featuring Hatsune Miku. “THE END” is the first Vocaloid opera project, an opera without an orchestra or a single human vocalist, constructed from multi-screen 3D images and computer-controlled electronic sound. Its use of 10.2 multichannel sound, through dual-layered 5.1 channels, as well as a cleverly constructed space formed from seven high-luminosity high-resolution projectors and four giant screens, creates unique 3D acoustic and visual effects within the theater space. In the midst of this concert hall turned electronic fortress, the virtual character Hatsune Miku begins her journey by asking herself ‘will I die?’. The only performers who appear on stage are Hatsune Miku, an animal character, and Keiichiro Shibuya, a musician constantly pushing the frontiers of music through his cross-genre work in pop, electronic sounds, experimental music, and sound installations. “THE END” is one of the answers Shibuya has reached through various explorations in his exciting pursuit of the extreme limits of new trends in the world art scene. Using the universal theme of ‘endings’, this piece takes a look at the realities and illusions of ‘life and death’ for people living in modern society. The visual direction for this piece, one of the most important elements, was undertaken by digital visual artist YKBX, world-renowned for his expressive animations. He and Shibuya worked together to produce the entire opera. The script was drafted by producer, playwright, and novelist Toshiki Okada, who has constructed a new methodology based on a thorough knowledge of traditional theatrical techniques. The stage aesthetics were headed by New York-based architect Shohei Shigematsu, while the surround sound program that envelops the theater was the work of sound artist evala. Meanwhile, top creators such as Pinocchio P, popular for their individualistic melodies and lyrics, participated in the Vocaloid programming process. The production was handled by creative production company A4A, long advocates for the fusion of art and technology, and the overall theater space set-up and direction was managed by the Yamaguchi Center for Arts and Media (YCAM), where “THE END” was created and had its first performance. The fact that Louis Vuitton’s artistic director, Marc Jacobs, and his team provided the costumes for Hatsune Miku has been a major subject of discussion for this piece. These items were original designs based on the Paris Spring/Summer collection, arranged for Hatsune Miku’s body-type and personality. The digitalized images of Hatsune Miku clothed in an original Vuitton check pattern revealed both a fully contemporary and completely new Miku, as part of this unprecedented special collaboration. This piece makes formative use of the accepted main elements of traditional opera, being the aria, recitativo, and tragic storyline. Though these same elements were often treated negatively, as something to be defeated, in 20th century opera, “THE END” makes use of these canonical elements for their continuity. Using the Vocaloid, Hatsune Miku, in place of a vocalist (voice and body) creates a strange situation leading to an opera, long symbolic of the human-centric world and modern thought, that has no human performers. With the fusion of pre-programmed chords and the flow of real time as its starting point, making free use of the ideas and concepts of media technology for the audio and visuals, this piece aims to dissect and transform opera with the goal of a radically new space/time creation that is neither traditional nor avant-garde. Up until now opera always dealt with human death, creating a situation where the abnormal exertion of life’s greatest energy by a person about to die was essentially linked to sound and acoustics. “THE END” takes note of this habitual format and treats opera as an anthropological mechanism of critique where the distortion of life and death unfolds. A new world emerges from “THE END”, one that escapes from the European anthropocentrism that was conventionally bound to civilization and art, a world that dissolves the boundaries between life and death, public and private, parts and the whole, layer and delineated, human and animal, existence and production. In this world, Miku, who has had a presentiment of her fate, talks with animal characters and degraded copies of herself to ask the age-old questions, ‘what are endings?’ and ‘what is death?’.